Selected from more than a dozen examples of this type of practice, these three projects each have stretched and pushed their institutions in new and productive ways, opening up unanticipated, thought-provoking, exciting, and even uncomfortable ways for visitors to experience an art museum. To help get a sense of how many arts enthusiasts, museum professionals, and educators are aware of these types of experimental museum projects, I’ve been asking readers to please take a few seconds and complete the poll below, if you have not already. Thanks for responding to the question above. Now onto the second telling case of great work being done in this area of museum practice. Machine Project’s Live Museum Soundtrack at the Hammer Museum. 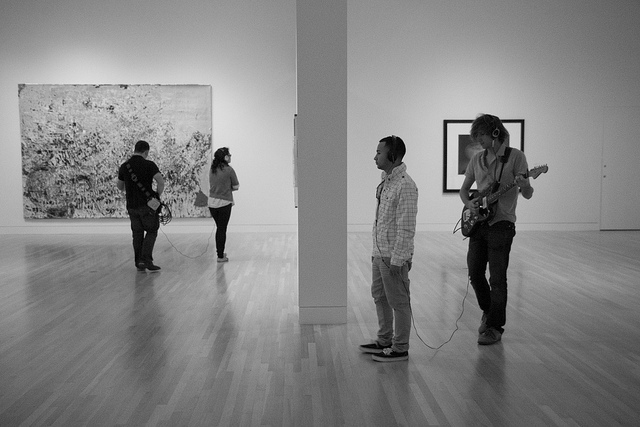 Guitarist Eric Klerks improvises music for each artworks this visitor views. In 2010, the Hammer Museum at the University of California, Los Angeles, invited the artist/performer collaborative Machine Project to produce a year of programming which proposed new, alternative, and experimental ways of presenting work at the museum. This decision came out of a process in which the museum worked with a newly-created Artist Council to address many of the visitor services issues the museum was struggling with. Striving to be a truly artist-driven institution, the museum received funding from the Irvine Foundation to create its Public Engagement Artist in Residence program, with Machine Project being the first. Over their residency, twenty-six projects were implemented, including personal soundtracks for visitors, staff pet portraits, table tennis, printmaking workshops, micro-concerts, and a giant animatronic hand that pointed people to different areas of the museum. 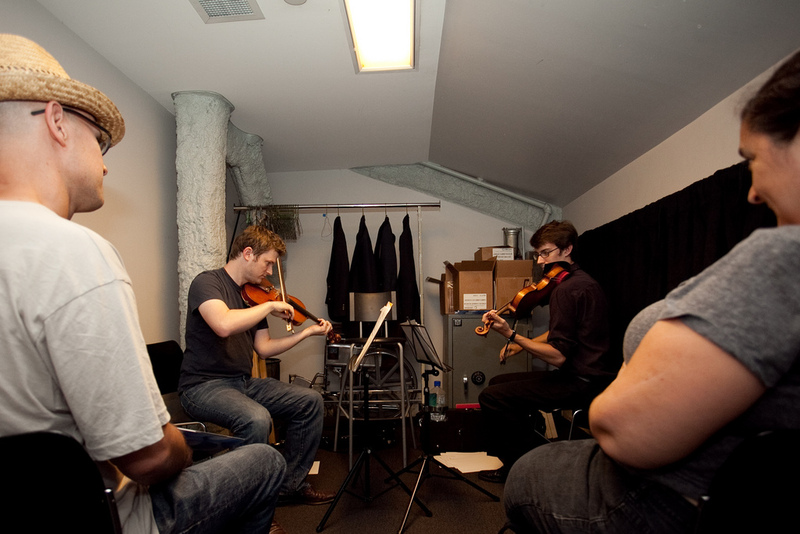 micro-concert as part of Machine Project’s residency at Hammer Museum. This single example of the Hammer Museum’s Public Engagement Artist in Residence program clearly indicates the value of artist-driven visitor engagement, and their work has served as a guide for other institutions to have “a better sense of the terrain” in pursuing similar endeavors.